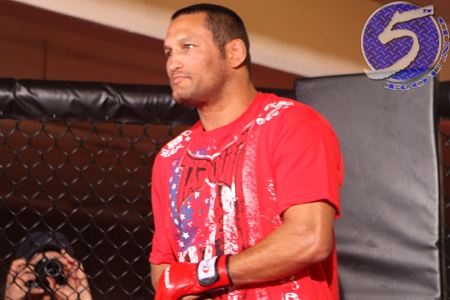 Just one day removed from posting a dramatic come-from-behind TKO victory over Mauricio “Shogun” Rua and two months prior to the curtain being drawn on UFC 173, Dan Henderson (pictured) has offered to step in for injured middleweight champ Chris Weidman and headline the May 24 show against Lyoto Machida. “Hey @danawhite, let me have @lyotomachidafw, just like you let him have @jonnybones when I got hurt,” Henderson posted on his Twitter account Monday night. Of course, Henderson is referring to the debacle that was UFC 151 back in September 2012. Henderson was slated to challenge reigning light heavyweight king Jon Jones for his throne, but tore his MCL and was forced to pull out of the title tilt. UFC president Dana White and Co. were scrambling for a last-minute substitute, first reaching out to Lyoto Machida, who turned down the tango, then Chael Sonnen, who gladly accepted. Of course, Jones wasn’t interested in being a pawn in the UFC’s plans by getting jammed in a lose-lose situation and declined the bout. White was then forced to cancel their first show since taking over the UFC in 2001. Henderson, who has competed strictly at light heavyweight since returning to the UFC five fights ago, has a few motives for wanting to jump right back into action. First and foremost, he can avenge last February’s controversial split decision defeat to Machida. Secondly, a win over the division’s top contender would allow Henderson to leapfrog the middleweight line and mark the shortest path to a championship affair. Lastly, Henderson doesn’t have much to lose. Unfortunately for Henderson, there’s no way Machida will forgo a guaranteed title shot just so Hendo can play hero by trying to save UFC 173. The current plan is UFC 173 will be assigned a new main event in the coming days, and Machida and Weidman will headline UFC 175 on July 5.